According to the American Chiropractic Association 9 out of 10 Americans suffer from headaches's at least occasionally. Let's explore the different headache types and where they come from. Then we'll see how chiropractic can help! 1. Tension: The most common among young adults. Occur near the forehead or sometimes the temples. As the name suggests these are stress related. 2. Cervicogenic: The word literally means beginning in the neck. These types of headaches start in the neck or base of the skull. Duke University researchers estimate that 17.5% of headaches are cervicogenic3. 3. 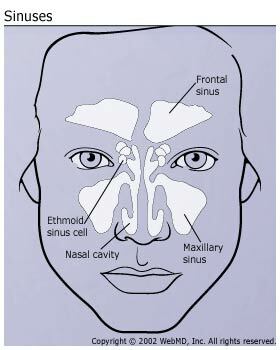 Sinus: Caused by inflamed sinus' (see diagram below). Associated with pain in the forehead, cheekbones or ridges around the nose. A quick test to determine if you have this type of headache is to look strait down. If this increases your pain (allot! ), then you have a sinus headache. May be associated with fever and facial swelling. 4. Migraines: The National Migraine Association estimates that approximately 36 million Americans have migraines at least occasionally. These are caused by expanding cranial arteries and are very painful. Often accompanied by olfactory or visual hallucinations, nausea, and/or an aversion to light. 5. Cluster (AKA trigeminal neuralgia): Very rare. Pain is usually only on one side of the head or jaw. Has been described as being more painful than child-birth. Caused by arteries dilating and putting pressure on the trigeminal nerve, which is found near the side of the jaw. Can Chiropractic Really Help Headaches? Yes! Headaches are one of the conditions I enjoy treating most. The reason is… headaches respond so quickly to chiropractic care. Most headache's are musculoskeletal in origin (with the possible exception of sinus headaches). 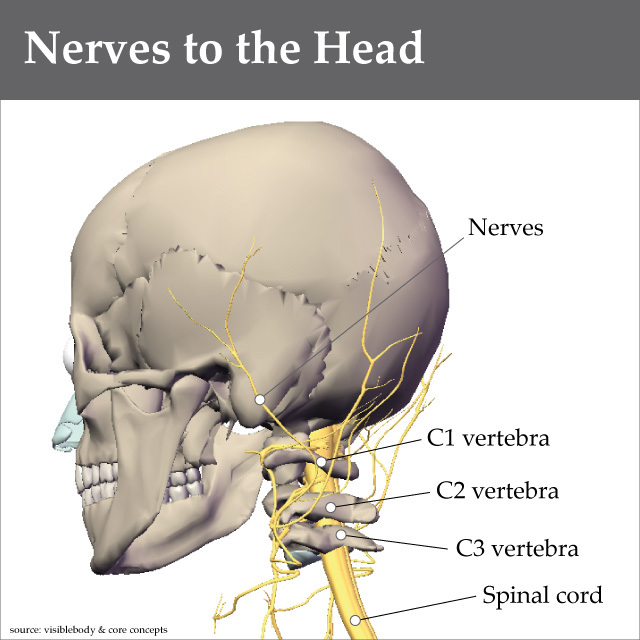 Tension and cervicogenic headache's both involve tight muscles and/or inflammation in the joints. Even migraines are affected by the nervous system. Migraines are known to be largely under the influence of hormones, which control the diameter of cerebral arteries. But, what do you think controls hormones? : The nervous system. Tight muscles and/or inflammation in the neck can cause an imbalance of hormonal levels in the brain. This causes migraines. Scientists from Duke and Northwestern Universities have shown that chiropractic is great at treating, tension, crevice-genic and migraine headaches2,3,5. Chiropractic was able to decrease both the frequency (by 69%) and intensity (by 36%) of cervicogenic headaches5. Furthermore, chiropractic was found to be just as effective at treating migraines as drug therapy4. Also, chiropractic was found to be great at treating intractable migraines during pregnency1. An intractable migraine is one that lasts more than three days. Cluster headaches are so rare that few systemic studies to investigate the effects of chiropractic care on this debilitating syndrome have been done. However, their are single case reports that verify chiropractic's effectiveness at treating cluster headaches. One man, James Tamasi, wrote a book7 detailing how chiropractic cured his cluster headaches! James was a successful business man with a debilitating disorder. The pain was so extreme he told his secretary to cancel all his tuesday appointments so he could commit suicide! Not knowing his plans, James' wife scheduled a chiropractic appointment on that very same tuesday. James' question to his wife was, "What time tuesday?. Would James still be alive to make that appointment. As it turns out he was. Chiropractic healed him, and saved his life! How does chiropractic heal headaches? Chiropractic works by breaking up scar tissue. This releases trapped inflammation. This has two main effects. 1. The nervous system works better with less inflammation and scar tissue to disrupt its nerve signaling. 2. 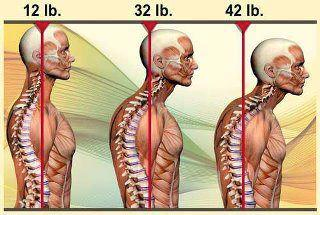 Your posture improves, especially when combined with postural exercises. Both of these are important if we want to stop chronic headaches from occurring. We've already discussed how the nervous system controls hormone levels turning your migraine on or off. Another effect is muscle tightness. When the nervous system is constantly stimulated by scar tissue, or inflammation, the muscles respond by becoming chronically tight. Tight muscles in the shoulders (trapezius muscle), temple (temporalis muscle), or forehead (frontalis muscle) cause headaches. As the picture below demonstrates every inch forward that your head moves, adds an extra 10 lbs of pressure on your shoulders. Why would this happen? Do you use the computer, read, drive, text, etc.? All these activities cause anterior head carriage. This means your shoulders and neck muscles must work extra hard to hold your head up. This leads to tight muscles and cause headaches. Chiropractic care can help manage or even cure your headaches. It does this by getting rid of scar tissue and inflammation, freeing up your nervous system to function better, and by correcting your posture. 1. Alcantara J, Cossette M. (2009). Intractable migraine headaches during pregnancy under chiropractic care. Complement Ther Clin Pract 15(4):192-7. 2. Bronfort G, Assendelft WJ, Evans R, Haas M, Bouter L. (2001). Efficacy of spinal manipulation for chronic headache: a systematic review. J Manipulative Physiol Ther, 24(7):457-66. 3. McCrory DC, Penzien DB, Hasselblad VH, Rebecca NG (2001). Evidence Report: Behavioral and Physical Treatments for Tension-type and Cervicogenic Headaches. Duke University Evidence Based Practice Center Executive Summary Evidence Report. 4. Nelson CV, Bronfort G, Evans R, Boline P, Goldsmith C, Anderson AV (1998). The efficacy of spinal manipulation, amitriptyline and the combination of both therapies for the prophylaxis of migraine headache. J Manipulative Physiol Ther, 21(8):511-9. 5. Nilsson N, Christensen HW, Hartvigsen J. The effect of spinal manipulation in the treatment of cervicogenic headache (1997). J Manipulative Physiol Ther, 20(5):326-30. 6. Tachihara H, Kikuchi S, Konno S, Sekiguchi M. (2007). Does facet joint inflammation induce radiculopathy? : an investigation using a rat model of lumbar facet joint inflammation. Spine 32(4):406-12. 7. Tomasi, J. What Time Tuesday? International Christian Servan, 2005.